Dinosaurs in the Wild is a unique and exhilarating blend of live-action theatre, theme park fun and the very latest palaeontological knowledge which transports visitors back 67 million years to encounter living dinosaurs as they’ve never been seen before. The multi-million pound experience launched at the NEC, Birmingham in June. It has now moved to Manchester’s EventCity, before arriving in London early next year for an eight-month long run on Greenwich Peninsula. The show uses cutting-edge audio-visual effects and dramatic storytelling to create an unforgettable prehistoric adventure. The lighting designer for the show is Adam Bassett from Woodroffe Bassett Design and he approached White Light to supply the majority of the lighting equipment and to also lead on the installation. WL Project Manager Paul McLean worked closely with WBD to provide the technology that would help fulfil their design. He states: “We have worked on many large-scale themed attractions both in the UK and abroad. That said, this project stands out in the sense that there is a large emphasis on lighting as props or as scenic integration, which meant that we had to reach out into the commercial lighting market for many of the fixtures that were used. 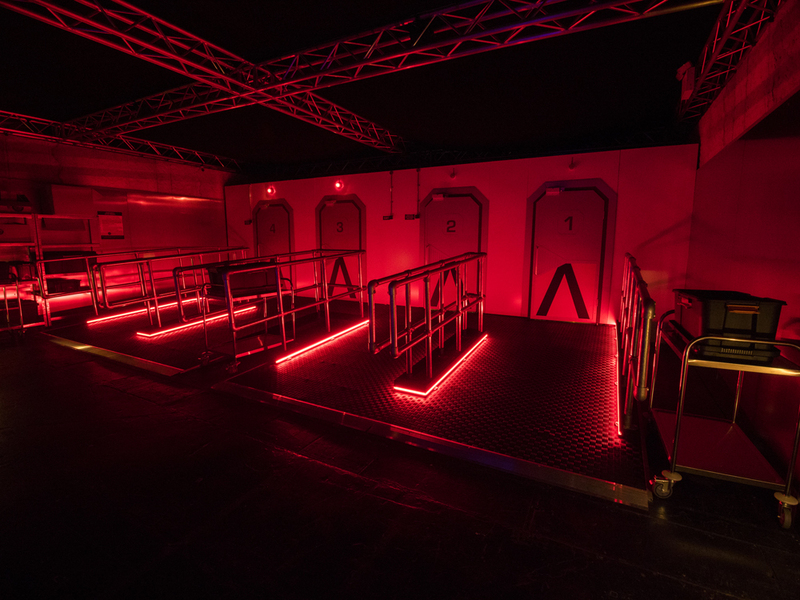 The attraction consists of sixteen main zones – each of which had a very different feel, so it was our role to source lighting that would enhance each one”. Paul worked closely with John Coman of WBD, Project Manager and Associate Designer, to ensure that their design was achieved in each individual space. Paul states: “We visited the site numerous times to walk around and assess which fixtures would be the most suitable, and ended up supplying some unusual kit, such as EPA Agrifloods, which are typically construction/working floods lights although still dimmable. Whilst these might not usually have been used on an exhibition in show state, when coloured up, they created the exact feel that Adam and John were looking for”. The Pre-Entry Zone installation alone includes over 70 metres of Blue LED tape, 51 Dimmable Agricultural Floods, 30 LED Technologies Floods, 110 Schnick Schnak C30 Strips and 10 Schnick Schnak M-Dot Clusters, along with several custom LED ‘instrument control’ panels and Elation TVLs for the green screen area. WL installed around 140 meters of LEDFlex DMX FLEX 32 tape with individual pixel control into the two Chronotex Time Pods (CTP) “time machines” and the escape tunnel towards the end of the attraction, which worked out at around 24 universes of DMX over Artnet. Each chair in the “time machines” is also fitted out with LED nodes, all being DMX controlled. 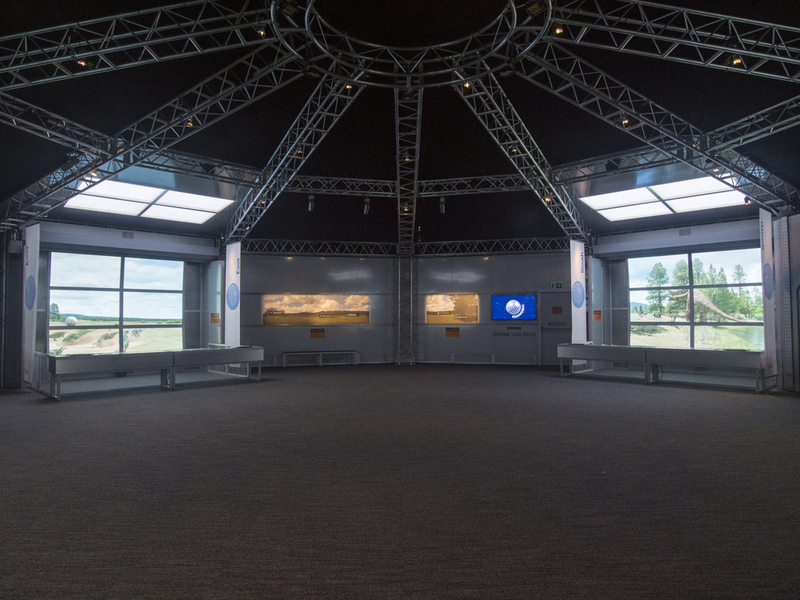 WL also built several LED custom fixtures, including 16 x 2m x 1.5m vari-white panels which were installed above the virtual windows of the Dinosaur Lookout Area to create four skylights, each comprising of four panels. Paul explains: “We used over 250m of vari-white LED tape in these to provide a CT range of between 2800 and 6500K. After a last minute design change, we also built 12 x custom Amber linear fixtures onsite, with these being installed overhead in the disembarkation zone leading into the labs. “We also supplied Tryka Module 1s which were installed at floor level lighting throughout the various tunnels and corridors; some triggered by PRI which allows the floor to illuminate as it is walked across”. For the other laboratory areas, WBD called on Lighting Assist to source a range of medical X-ray displays and commercial ‘shop’ fittings to give maximum authenticity. WL also supplied ETC Irideons, Source 4 Mini LED and Selecon Accents. The total fixture count came in at around 700 units along with 550m of LED tape. Almost the entire rig is LED, except for around a dozen fluorescents in the Animal Lab and a handful of flashing beacons dotted around the tunnels. The lighting setup was controlled via a Pharos LPC40. Paul states: “Shows like this are entirely dependent on repeatability, reliability and integration. It is a 4D experience combining the usual array of different elements such as 3D video, audio and stage machinery. 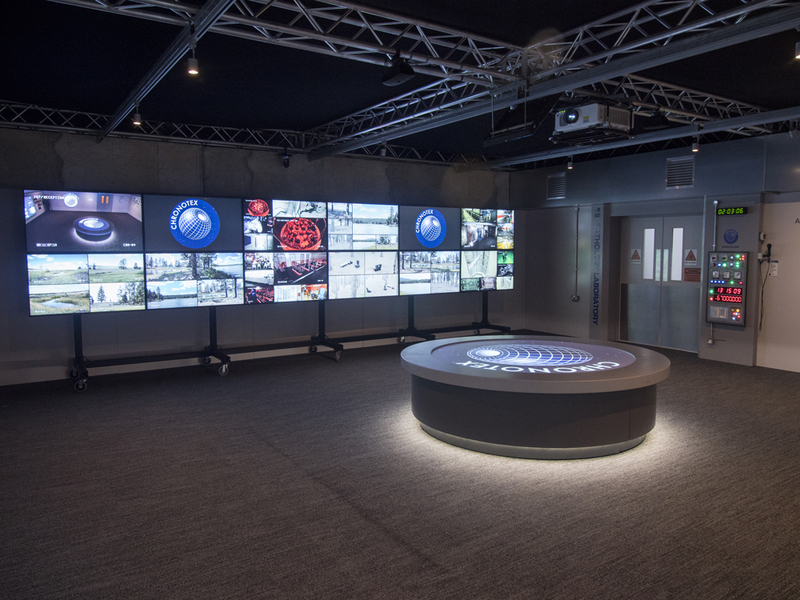 The designers needed to pull all these together, to ensure that it was a truly immersive experience that was repeatable and technically reliable”. The Pharos is fed three individual SMPTE timelines and a variety of MSC commands along with several switch/contact closures which are triggered by the actors as the show progresses through the space. 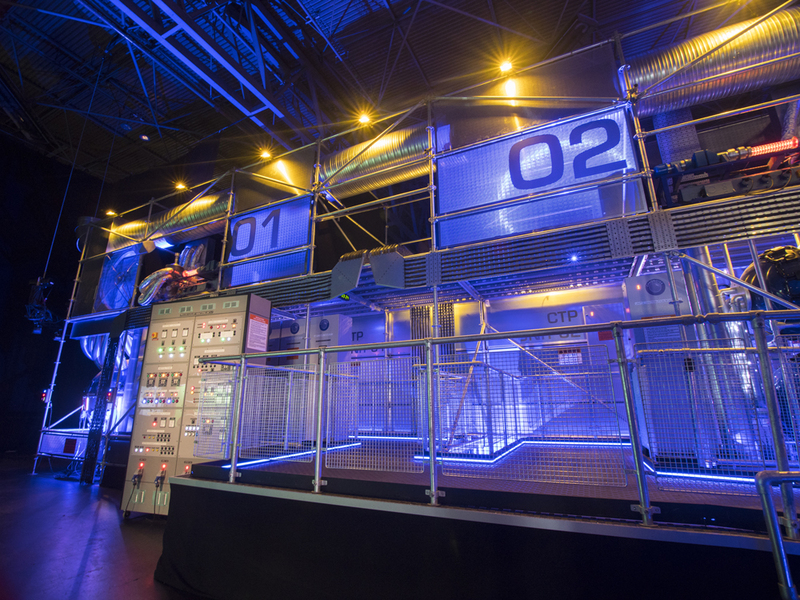 WL began work on March 13th at Scena in Croydon for the build phase, working closely with the build crew and props department, and stayed on-site for six weeks at the NEC to ensure that everything was in place prior to the June 24th opening. Paul states: “Due to the fact that the various technical and scenic aspects are reliant on one another, we knew that certain elements would change during the install period as the design progressed and was finalised. A large part of our role was to be adaptable to the various changes and to ensure that what we supplied elevated what is an intricate and complex space”. 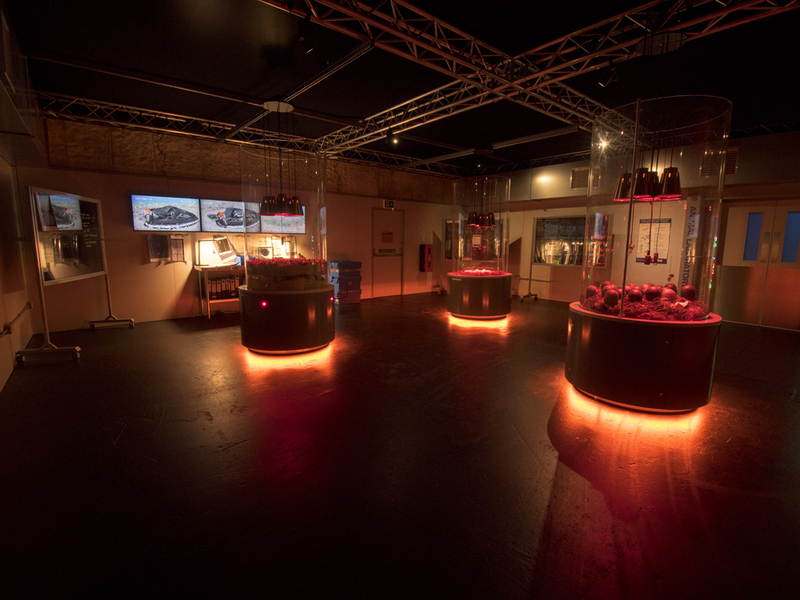 The project also marks another instance of WL working with Woodroffe Bassett Design, following their recent collaboration on the Pink Floyd: Their Mortal Remains exhibition at the V&A Museum. Paul states: “Dinosaurs in the Wild was a great example of us finding a lighting solution that was bespoke to this particular project. The different zones and themes meant our only choice was to source lighting from very specific industries or to custom-make it for this show. With our resources and expert staff, we were able to supply fixtures that were not only ideal for each zone but also helped enhance the entire experience for visitors”. Photos courtesy of Dinosaurs in the Wild.